We saw this broken gastropod from the Pliocene of Cyprus in this blog post about two and a half years ago. I recently rediscovered it while sorting specimens and decided to show this intriguing perspective through the broken part of the shell. It was collected on a Keck Geology Consortium expedition to Cyprus in the summer of 1996. My Independent Study student on that expedition was Steve Dornbos (’97), now a professor of geology at the University of Wisconsin, Milwaukee. One sunny day Steve and I came across a beautiful coral reef weathering out of the silty Nicosia Formation (Pliocene) on the hot and dry Mesaoria Plain in the center of the island near the village of Meniko (N 35° 5.767′, E 33° 8.925′ — go ahead, search these coordinates for a great satellite view). The reef records the early recovery of marine faunas following the Messinian Salinity Crisis and the subsequent refilling of the basin (the dramatic Zanclean Flood). Steve and I published our observations and analyses of this reef community in 1999. 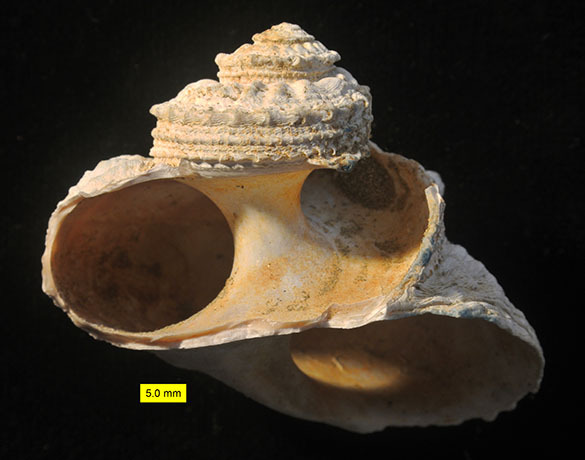 Our featured fossil is the herbivorous turbinid gastropod Astraea rugosa (Linnaeus, 1767). That beautiful generic name means “star-maiden” in Greek and was originally used by Linnaeus in homage to the mythological Astraea, daughter of Zeus (maybe) and a “celestial virgin”. The species name rugosa means “rough” or “wrinkled”, in reference to the many ridges on the shell. The common name for this species, which is still alive today (as you can see in this video) is “rough star”. In the top image you can see the internal shell twist at the axis of coiling called the columella. 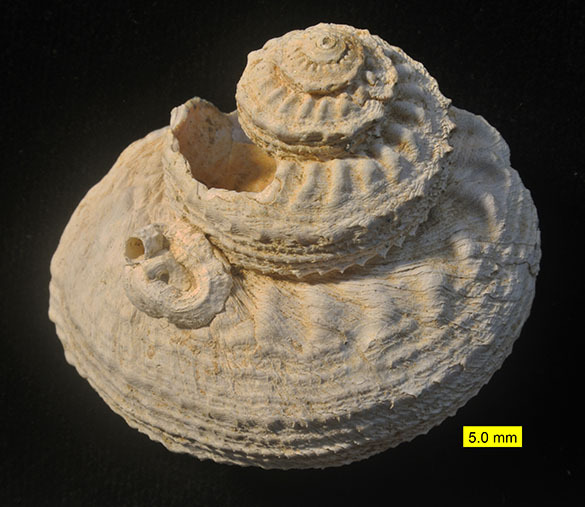 In the image above is a delicate little coiled tube of the vermetid gastropod Petaloconchus preserved where it attached to the shell about five million years ago. Stay tuned here for additional fossils from the Pliocene of Cyprus. They are too good not to share! Cowper Reed, F.R. 1935. Notes on the Neogene faunas of Cyprus, III: the Pliocene faunas. Annual Magazine of Natural History 10 (95): 489-524. Cowper Reed, F.R. 1940. Some additional Pliocene fossils from Cyprus. Annual Magazine of Natural History 11 (6): 293-297.